Since beginning our inventory of the Trust’s collections, the project has illuminated some wonderful discoveries. It’s hard to know what to choose or where to start, but one thing is for sure: the selection of objects we’ve eventually chosen is very revealing of the breadth of the collections in the care of the National Trust for Scotland. So, let’s start in the north and work our way through Scotland. The first three objects come from our northernmost team in the North West, currently working at Brodie Castle. 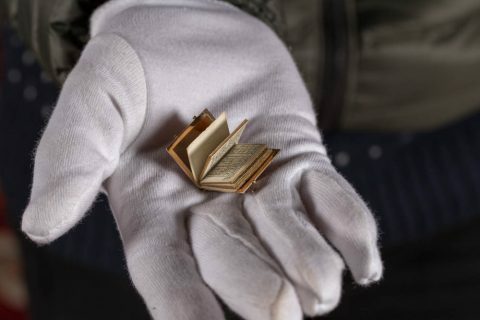 1) Oliver: This book is possibly a captivating read, and it certainly appears to look the part; however, one would have to be a Borrower to enjoy reading its tiny print! 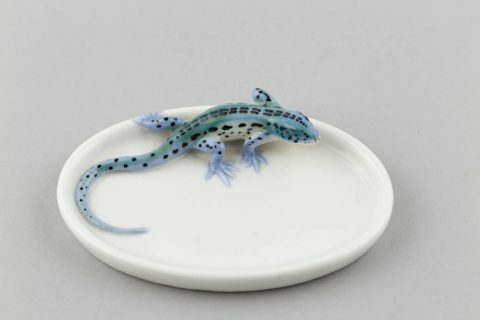 2) Liz: A ceramic lizard sits on the edge of a small white ashtray. Clear blues and greens with the black marks of a wall lizard: happy holiday memories in a storm swept castle! 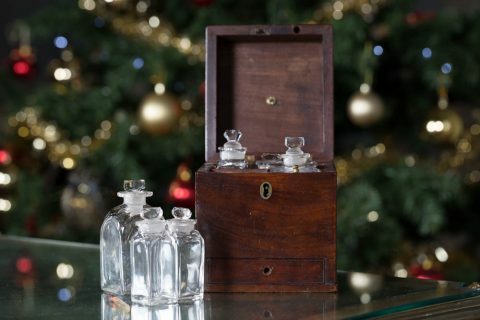 3) Robyn: This 19th-century apothecary box is an unusual survivor of bygone times – definitely something that wouldn’t be used today! It contains an array of bottles but, rather tantalizingly, its small drawer is stuck shut. Heading south a little, our next three collection items come from the team in the North East. 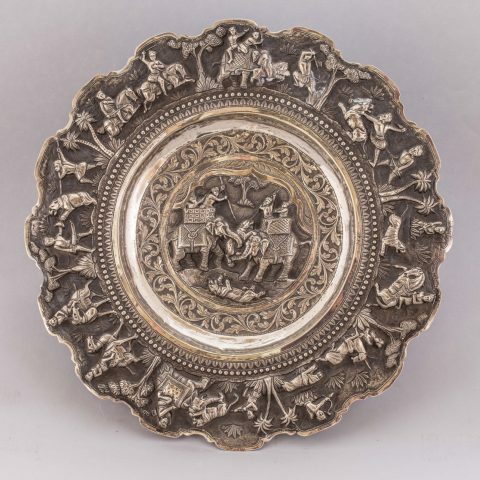 4) Bill: Found in Fyvie Castle’s Preston Tower, this metal charger with decoration in relief depicting various hunting scenes was a welcome sight to weary eyes, having spent most of the day photographing beds and wardrobes. 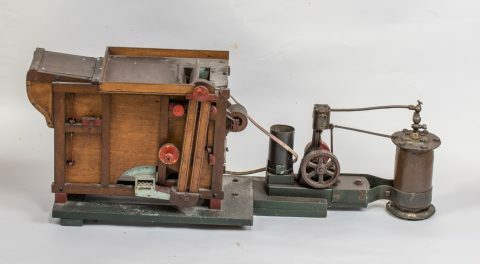 5) Ross: This model threshing machine from the Museum of Farming Life collection at Pitmedden Garden displays some fantastic craftsmanship. The fact that it appears to be steam powered makes it that little bit more interesting. 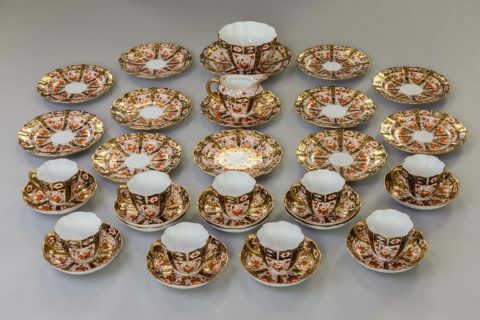 6) Marianne: This Royal Crown Derby porcelain tea service from the late 19th century, kept in Pitmedden House, is the first set I updated and marked entirely on my own, so it’s special for me! Indigo manages the teams in the north and she’s sniffed out a rather unusual object. 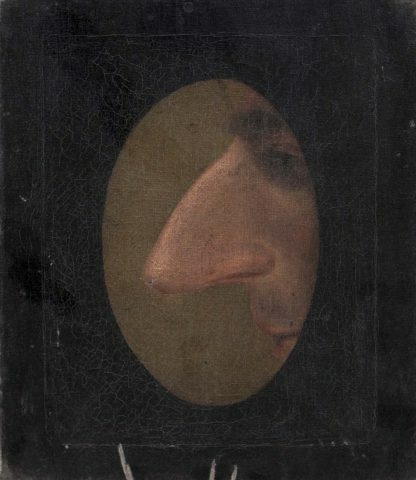 7) Indigo: I love this portrait of a nose, at Brodie Castle, believed to be a caricature of a well-loved feature of Brodie family physiognomy. I think a beautifully painted picture of your finely proportioned nose would be a fabulous Christmas present! Our Project Reveal Team East have uncovered some unique objects while working at Culross, Newhailes and the Georgian House. 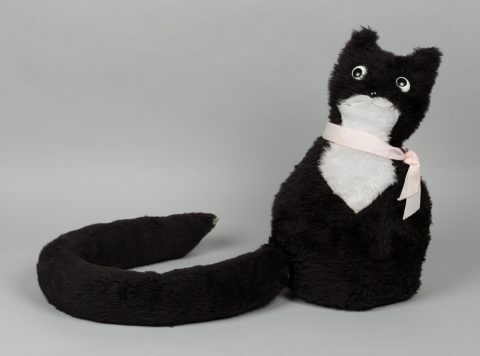 8) Alex: Not only is this doorstop from Newhailes shaped like a cat but its tail can also be unhooked for use as a draught excluder. It has the best expression I have ever seen on an object. 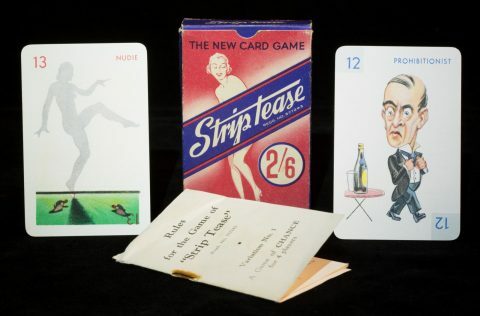 9) Michelle: ‘Striptease’ is a 1930s whist-style card game that I discovered in one of the drawers at Newhailes. The images and characters are a fascinating insight into the moral values and social culture of the period. 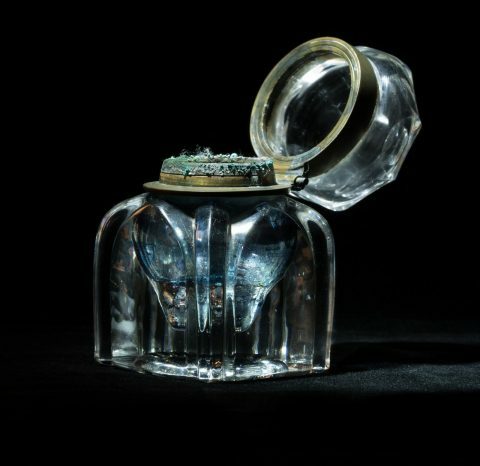 10) Kevin: I was drawn to this inkwell as it seems to capture Newhailes’ scholarly past perfectly. The verdigris on the rim, the air cast into the glass: Newhailes is caught like a fly in amber. 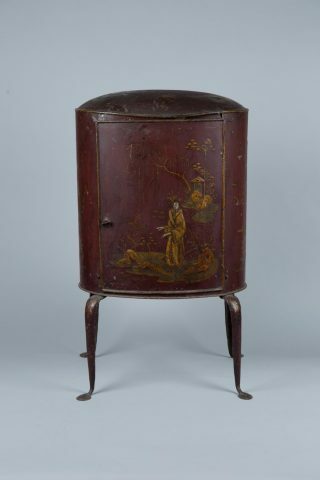 11) Rachael: This japanned Pontypool tin plate warmer in the Georgian House is a rich red colour and is decorated with beautiful Japanese-inspired artwork. It is both a decorative and useful piece that would have helped go some way towards getting a hot meal. 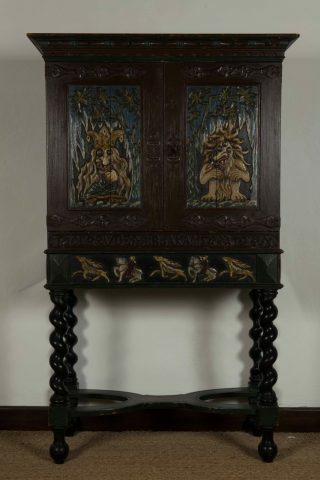 13) Christophe: This beautiful walnut escritoire was locked when we came across it at Culross. Fortunately, we managed to find the key inside a nearby teapot, and uncovered all sorts of hiding places behind its façade. Team Manager (or should that be Games Master?) Rohan has picked something musical, perfect for Christmas. 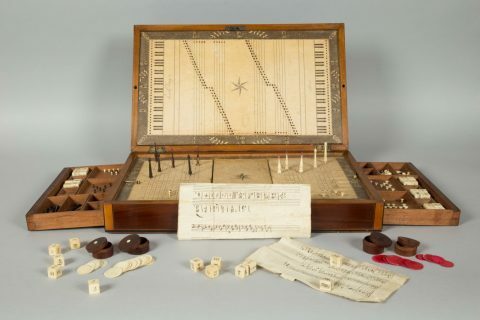 14) Rohan: This musical board game, designed by Anne Young and made in Edinburgh in 1803, was rediscovered in a cupboard at the Georgian House. It was intended to be an ‘Introduction to Music’ and came with instructions for playing several games. That’s two teams done, and we’re 14 objects into our 25 discoveries. Come back for part 2, when we will reveal more of our favourite objects. This article was originally published by the National Trust for Scotland on December 15, 2017.